"We fully realize the importance of critical geospatial infrastructure and information in helping countries and decision-makers make more informed decisions on mitigation and preparedness." Geospatial information underpins the majority of economic and sustainable development activities in the world today. The services provided by Pacific Island geospatial scientists and surveyors contribute to the security and well-being of Pacific people, supporting numerous industries and sectors. These include natural resource management, civil engineering, climate change adaptation, disaster risk reduction, transport, land ownership, health, and agriculture to name a few. In November 2014, a group of Pacific regional surveying and geospatial experts met in the margins of the annual Pacific Geospatial Information Systems and Remote Sensing (GIS/RS) User Conference in Suva, Fiji. It was at this meeting that the Pacific Geospatial and Surveying Council (PGSC) was first envisaged and a charter governing its mission and objectives was developed. The PGSC aims to achieve these goals by coordination, communication, and collaboration as well as sharing resources and applications of location information through regional and global partnerships. 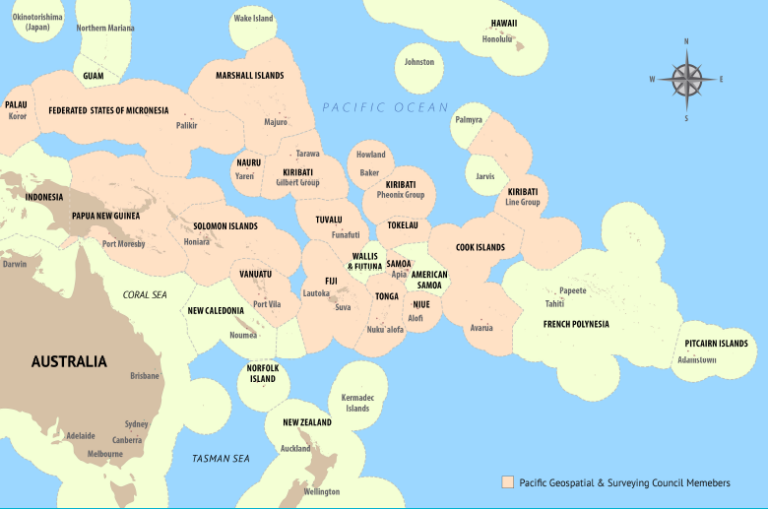 The Pacific Geospatial and Surveying Council, also known as the PGSC, is an independent regional advisory body that provides a forum for Pacific Island geospatial information and survey authorities to discuss and address regional challenges. Sustainable development in the Pacific enabled by world-class geospatial information and surveying services. Learn more about the Pacific Geospatial and Surveying Council Strategy 2017-2027.